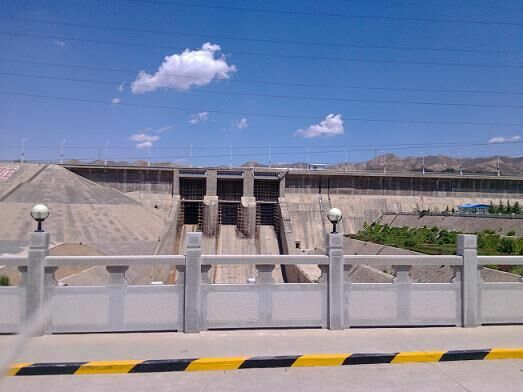 Liujiaxia hydropower station is located in gansu province on the Yellow River mainstream yongjing, 100 km from lanzhou city. Plant development are mainly composed of power generation, flood control, irrigation and industrial water supply in cities and towns of give attention to two or morethings, etc., is a large backbone power station of northwest power grid. Liujiaxia hydropower station flood discharge building consist of spillway flood discharge tunnel, the sluiceway, and PaiShaDong. The spillway is one of the largest drainage buildings. Spillway is located in the right bank of the hub station, using the original old channel of the Yellow River terrain excavation, the center line of the pile number right 0 + 324.00 m, orthogonal to the dam axis, the total length of 875 m. First on auxiliary dam concrete overflow dam on the left, and right for connecting auxiliary dam and loess auxiliary dam. Overflow weir at the forefront of water retaining width 48 m (including side piers), canal bottom width of the pile under the number + 0 0 + under 136.246 m to 136.246 m, on both sides of the wall in high shrinkage rate, by 42 m gradient is 30 m.
The overflow weir weir crest elevation of 1715.00 m, the overflow hole for the three 10 m x 8.5 m. Every hole entrance section is equipped with a 10 x 8.5 -- 21 m plate fixed wheel working gate, no maintenance gate. Working gate by the installation within the height of 1736.00 m room QPQ2 x 1000 kn fixed winding type opening and closing machine operation. Each hole pier 6 m thick, in the middle of the sluice pier set expansion joints, divide YanTi into three dam section, each paragraph 16 m wide. The overflow weir dam foundation excavation lowest elevation of 1693 m, foundation excavation surface micro upstream. Upper overflow weir crest platform consists of the pier, parapets, and the opening and closing machine operation platform, and form an organic whole. Laying prefabricated pier top cover plate to form the dam crest pavement width 10 m, under the cover plate for the opening and closing machine room, crest upstream entity parapet wall. Because the water level in recent years, great changes have taken place work spillway gate door slot lost normal maintenance conditions. In order to ensure the spillway working gate and reliable operation, need to add spillway bulkhead gate, working for the spillway gate create maintenance conditions. (2) need a diver to cooperate work after sealing, follow-up work with dry land construction conditions. (3) the main equipment need to be repeated use. (4) high demands on safety civilization construction. (5) the long operation period. Add the concrete surface in the front of the dam spillway bulkhead gate is used as the support and the sealing surface of the floating gate. Floating gate is a large tank structure, through to certain filling water tank filling drainage operation of the gate. Gate according to determine the water filling water filling until the gate has certain negative buoyancy, enable it to under the operation of the dam surface equipment along the guide to a predetermined gate hole sealing position to block of spillway bell, bell mouth after drainage of gate and built-in parts in dryland overhaul.